Water levels at 30 river stations monitored by Flood Forecasting and Warning Centre (FFWC) have marked rise while 62 stations recorded fall. Among the 94 monitored stations, two river stations have been registered Steady, a bulletin issued by the FFWC said on Saturday. The Brahmaputra-Jamuna, the Padma and the major rivers in the Upper Meghna basin are in falling trend which may continue falling in next 24 hours, the bulletin added. According to information of Bangladesh and Indian Meteorological Departments, there is chance of heavy to very heavy rainfall in South-Eastern regions of Bangladesh and adjoining Indian regions in next 24 to 48 hours, it added. 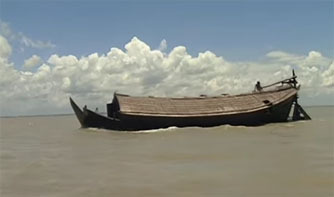 As a result the Feni, Halda, Sangu and Matamuhuri rivers of South-Eastern regions in the districts of Feni, Chattogram, Bandarban and Cox’s Bazar may rise rapidly. Significant rainfall was recorded at some stations in different districts during the last 24 hours ending at 6 am today. A total of 107 millimetres (mm) rainfall was recorded at Jariajanjail and 48.5mm at Nakuagaon.